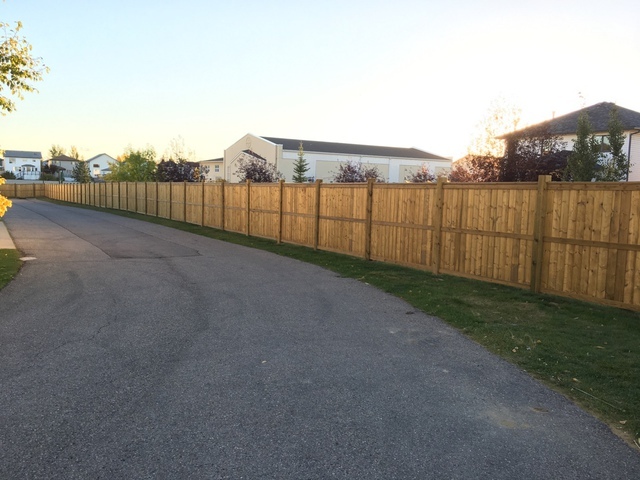 We recently had a fence installed in our newly developed community. 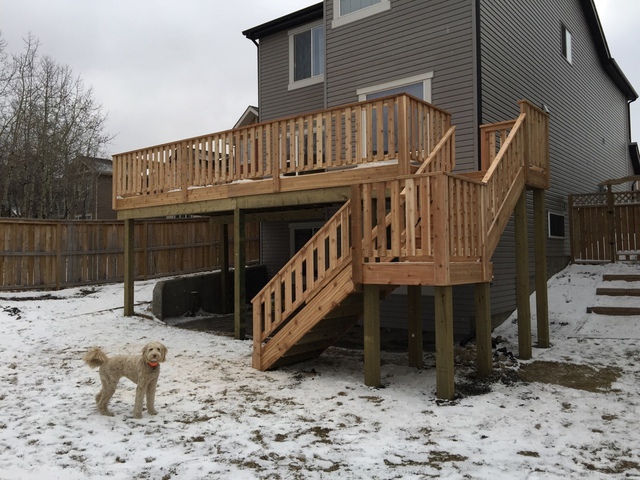 Calgary Fence & Deck came out and gave us a free quote, it took him about 15 minutes to measure & calculate the cost, we received an e-mail the next day and were able to begin the building process within two weeks. Everything was beautifully & professionally done, they even took care of the drawings & acquiring a permit from the city. The price was a bit of a draw back, it seemed a bit expensive (about 55 ft of fencing & two gates) but we are happy with the end result & the privacy we now enjoy. Thank you Tori....hope you're enjoying your property. We had a fence installed in our newly developed home, it was about 60 ft of fence with two gates. It was on the pricier side but I feel that if you get a cheap price you get a cheap product. We have been very happy with our fence, they did a great job. They were very quick to get us a quote & had the work done within a week of us deciding to go ahead with it. Thank you Donny ...was great to work. 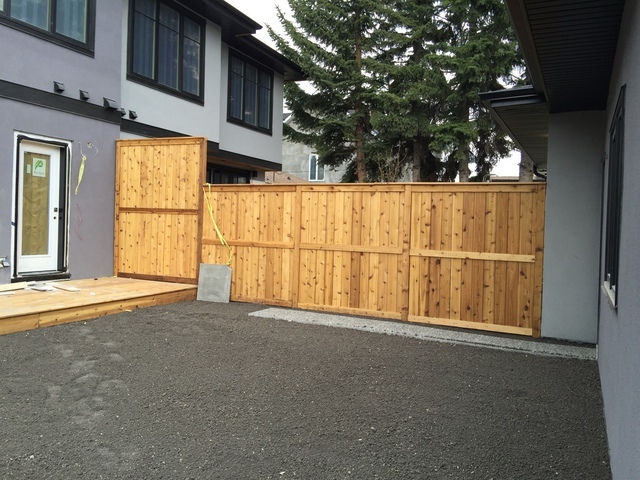 I had a fallen fence that needed repair, so we hired Calgary Fence and Deck. They did the job in a timely manner and provided after care service as well. Will recommend to anyone who needs a fence done. Thank you Connie ...so appreciative for the review. 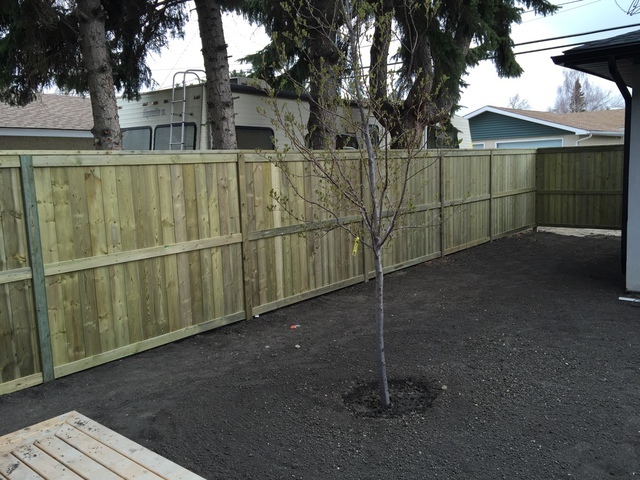 Calgary Fence & Deck is a trusted and referred leader in residential wood fence and deck construction. If you are looking for a reputable full service builder, look no further. We have the expertise you need and the service you can trust, at a price you can afford. Call us today for a free professional on-site consultation and quote for your project. 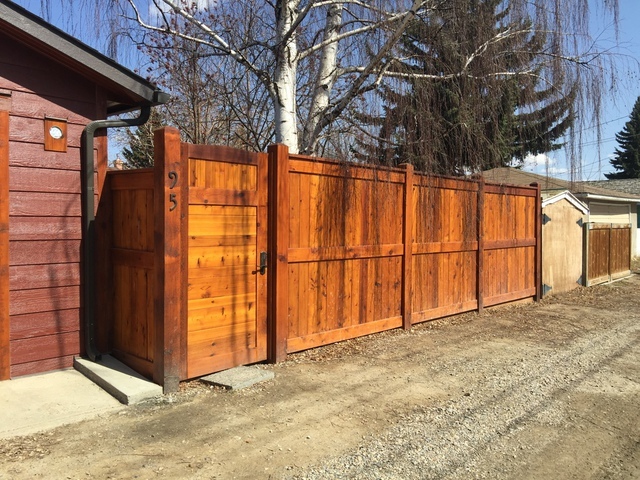 Wood Fence Construction (pressure treated & cedar) - Affordable solutions for all of your wood fencing needs. Our quality fence contractors can design and build the fence that fits your needs and your budget. We don't sub-contract fence construction to other companies or workers, jobs are all completed by our full-time staff of fence carpenters. Wood Deck Construction (pressure treated & cedar) - Quality deck contractors at an affordable price. Low cost doesn't have to mean low value. 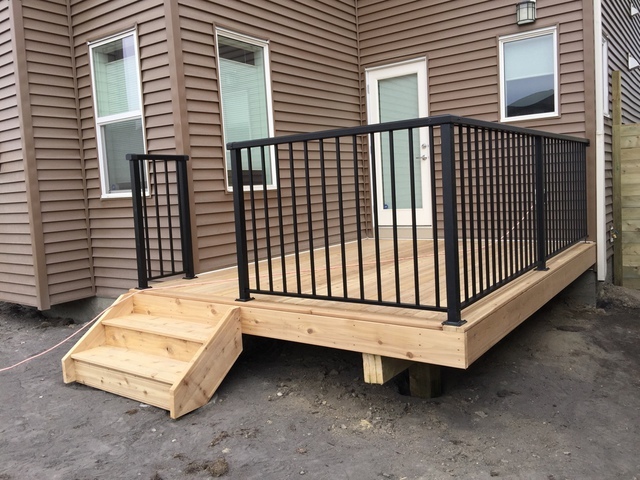 Our deck builders are highly efficient while maintaining close attention to detail. We don't sub-contract deck construction to other companies or workers, the jobs are all completed by our full-time staff of deck carpenters. Composite Decks (Trex & Other Brands) - Composite decking truly stands up to the test of time and it's easy to keep clean. If you want a longer lasting, virtually maintenance free decking solution, we recommend investing in name brand composite decking. Our deck installers have lots of experience installing composite deck materials on pressure treated frames. 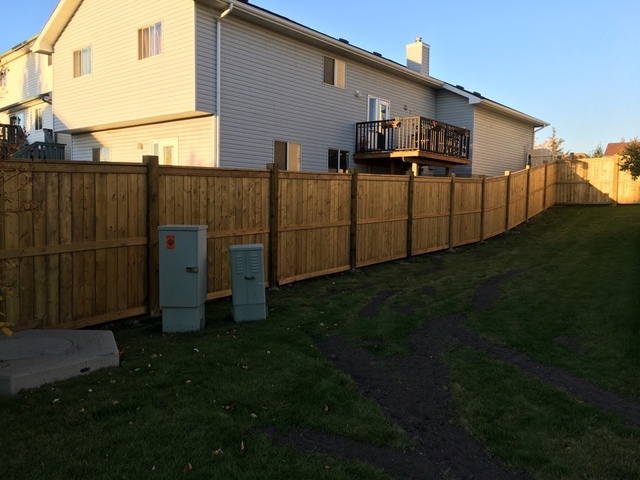 Replacements & New Projects - Fence replacement and deck replacement is not a problem, we take care of removal and haul away of your existing fence or deck. In some cases your fence or deck can be removed and replaced on the same day (ask for details). The Top 5 Questions To Ask Your Fence & Deck Contractor: If you are considering hiring a professional fencing contractor or deck builder, there are few questions you'll want to ask before getting started. Here are the top five questions to ask your contractor: 1) Ask if a deposit is required - Reputable fence builders and deck builders don't need to ask a customer for a deposit to begin work. A decent contractor should have the financial ability to purchase materials up front, and the confidence to deliver the final project in order to get paid for the job when completed. 2) Ask about insurance and licenses - Hiring a "handyman" or somebody doing construction work "on the side" to build a fence or deck may cost a little less up front, but there are several risks involved if they don't have the proper license or insurance. If somebody gets hurt during construction for example, you may be responsible via your homeowners insurance. Fence builders usually don't need to get building permits, but deck builders often do - so this will often be a problem for unlicensed deck contractors. Professional fence and deck contractors will always carry adequate insurance and the proper local business licenses. 3) Ask about extra charges - Sometimes you will receive an "estimate" from a fence company or a deck company instead of a "quotation". Often times other contractors will add extra charges along the way that may or may not be confirmed with the homeowner first. If you have already committed to the project with a particular fence and deck contractor, it can be harder to contest any extra charges along the way. Fence and deck projects generally have little or no cost changes along the way, so make sure that you are receiving a price "quotation" in writing that will represent the final bill for the project as described. 4) Ask your deck or fence builder if they use screws or nails - Although most wood fence contractors and wood deck contractors these days are only using screws in their construction, some companies will still use nails. Using a nail gun is faster than screwing, and some people will try to convince you that nails are a better solution for various reasons, but the fact is that nails will fail sooner than screws in outdoor fence & deck construction. Quality fencing companies and deck contractors will never consider using nails, especially with pressure treated lumber which can easily twist and bend free from nails as it dries. Furthermore, you'll need to ensure that you are hiring a company that is using the proper grade of outdoor screws that are approved for use in the material being used. 5) Ask about a warranty - A reputable builder should offer a warranty on the workmanship of the finished project. The material warranty, if applicable should also be passed along to the homeowner and will vary in terms and length. The labour warranty should be at least two years to allow for full exposure to all four seasons a couple of times - this will expose any workmanship problems that would need to be addressed. Also consider that a warranty is only valuable if the company remains in business - a warranty from a very small company or single individual is generally worth much less than a warranty from a reputable larger company that has been established for many years. 2 years on Workmanship. Please ask for details.